You are buying the Zest Plus Nasal Mask With No Headgear Fisher & Paykel 400HC560, manufactured by Fisher & Paykel. Fisher & Paykel is a leading manufacturer of CPAP Masks and accessories. At ADW Diabetes, we offer the complete line of Fisher & Paykel CPAP products with excellent pricing and fast shipping. You are buying the Zest Plus Nasal Mask With No Headgear Fisher and Paykel 400HC560, manufactured by Fisher and Paykel. Fisher and Paykel is a leading manufacturer of CPAP Masks and accessories. At ADW Diabetes, we offer the complete line of Fisher and Paykel CPAP products with excellent pricing and fast shipping. 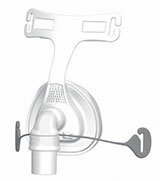 Zest Plus Nasal Mask With No Headgear Fisher and Paykel 400HC560 features FlexiFit Technology provides a greater range of movement at the nasal bridge, simplifying the fitting process while improving the seal and comfort. The Zest Nasal Mask includes a Unique Glider Strap provides freedom of movement while maintaining a seal. The Easy-Clip Zest Foam Cushion and Silicone Seal allows one-step connection or removal for quick and effortless cleaning. The Zest Nasal Mask is designed and contoured using the Fisher and Paykel Healthcare Anthropometric Database to meet the goal of: one size to fit most.